Adding a deck and patio onto your home is a very popular DIY project for any homeowner looking to improve their home. Decks not only enhance the look of your home, but it also increases the retail value of your home because decks add an extra living space to your home. Today decks and patios are becoming more and more popular because of their elaborate designs. Homeowners are expanding the rooms in their house to extend into the outdoors, created outdoor kitchens and living rooms. Deck design ideas are no longer just a place to grill, they are now an extra space in the house to entertain guests and spend time with your family. Another common type of railing to use is aluminum deck railing or metal deck railings. These materials can be incorporated into any type of deck and look good with brick or wood decking. 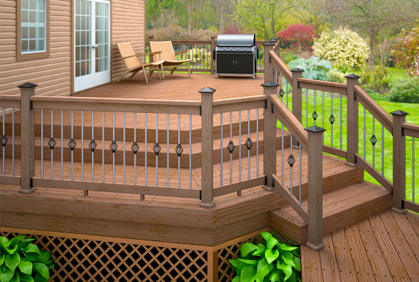 For wood and composite deck railings you will have three main components: support posts, balusters, and rails. The support posts are very important because they are the sturdiest component of the deck railing. They are spaced out evenly throughout the perimeter of the deck with balusters in between. Deck balusters are smaller pieces similar to the support posts, but they do not provide as much support. 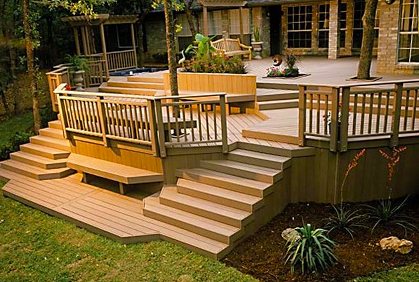 Make sure to pick materials that blend well together and complement each other to enhance the look of your deck. Dark metal deck railings go well with brick or concrete patios, while wooden railings tend to look best with timber wood decks. There are a variety of deck railing styles and material that you can choose from to achieve the perfect look for your deck. 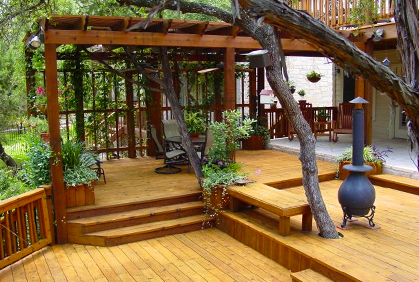 The most common type of deck built today is a wood deck. The materials that these types of decks are made of vary, but generally they are made of timber decking or composite decking. 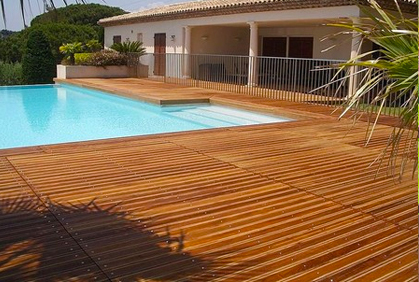 Timber decking is made from any type of real wood, so the railings should be built to match. 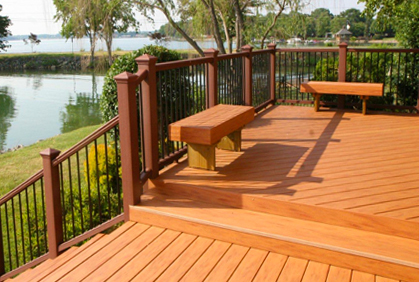 For those homeowners with decks that are made of composite decking, you should pick railing materials to match. Composite decking is often used because it is easier to maintain than wood and tends to last longer so it is a good idea to keep using this material so your whole deck has a long lifetime. If you would like to construct your deck floor out of sturdy, durable material at a lower price, consider using Composite deck flooring. Composite decking is made from a combination of plastics and wood fibers that help it to be durable and weather resistant. Interlocking deck floor tiles are the perfect option for a quick touch up to your floor because they are easy to install. They are placed in between each baluster and are connected by the rails. The rails are the horizontal components of the railing that connect the balusters and support posts. There are a variety of different styles of deck fencing to choose from including the support posts and balusters. You can get simple square shapes, dowel-shapes, and ones that are shaped by a lathe. The rails can be simple shapes as well, or they can be carved into more elaborate, decorative shapes. Post caps, or decorative tops for the deck light posts, can also be added to the support posts to enhance the look of the deck. Some post caps are made with lights in them, sometimes solar powered, so think about if you would like to incorporate that into your deck railing design. Metal and aluminum railings have similar components however, they tend to be thinner. Make sure to pick the right material to build your rail out of to enhance the look of your deck and improve your overall outdoor living experience.